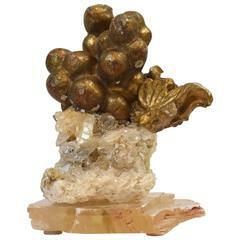 Beautiful giltwood ornament. Laurel with oak leaves, Italy, circa 1750. Weathered condition. Measurement includes the base. Beautiful giltwood neoclassical vase, Italy, circa 1780. Weathered, small losses and old repairs. Measurement with the base. 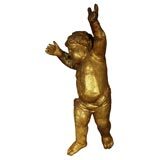 Hand carved, hand-gilded wood statue of a cherub with his hands extended to the heavens. Giltwood putto on foliage, Italy, early 18th century. 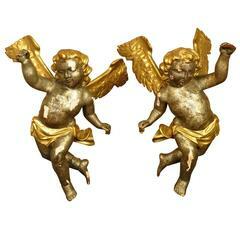 A delightful pair of 18th century Italian puttini or cherubs in giltwood. 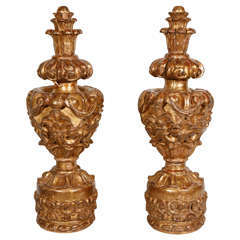 Wonderfully carved with delicate features - lending this pair elegance and charm.